Italy's scenic routes should be discovered with your special designed road trips. Italy has so much to offer from Venice to Tuscany, Umbria to Amalfi Coast, Sicily and Calabria and all the great cities like Rome, Florence and Milan. Exploring the countryside between the big cities and you will be surprised by the change in scenery and by the many little villages which present quite a different image of Italy. We will provide the best driving tours of Italy from the great lakes of Lombardia to the luxurious villas in the Tuscan heights, from the galleries and museums of Verona to the picturesque villages of the Cinque Terre. History enthusiasts will be fascinated by the many museums in Rome or Florence. Our tours include "Must-see" sights and special-interest sightseeing, historic sites and natural history, scenic routes and recommended walks, special spots for children, and also restaurant recommendations. Get the most out of your driving tour with our special knowledge. Italy is separated from the rest of the continent by the massive bulk of the Alps. The great range's southernmost peaks and valleys encroach upon Piedmont and Lombardy and on a clear day, from Torino (Turin), Piedmont's capital, and the centre of an arena of mountains, it is possible to look back and admire Mont Blanc. From Torino to Milano the landscape descends gently towards the Po, the river that devides Piedmont practically in half. It continues into Lombardy which, with its five magnificient lakes, its rivers and its canals, is endlessly watery and enviably fertile. The Po forms the region's southern border with Emilia-Romagna before it flows out to the Adriatic at the bottom of the Veneto. Emilia-Romagna was once northern Italy's greatest attraction. Every inch of the plain of Emilia-Romagna right up to the Apennines in the south is still under cultivation. So prolific is the area's produce that Bologna, Emilia-Romagna's capital, is known as "La Grassa", "The Fat". Dolomites of the eastern Alps and the marshy lagoons around Venice, the Veneto is also just as varied. But its reputation has more to do with art and architecture, particularly of the Renaissance. Its hills and southern plain are filled with towns and villages whose past affinities with Venice are acknowledged usually by an ancient stone-carved lion of St Mark - the Venetian symbol - placed conspicuously in the centre of the town. The Apennines, skirting the Gulf of Genova and the Ligurian coast, link the Maritime Alps on the Italian-French border with the mountains of Tuscany. But this, together with deep, wooded valleys and an idyllic climate, is all that Liguria and Tuscany have in common. 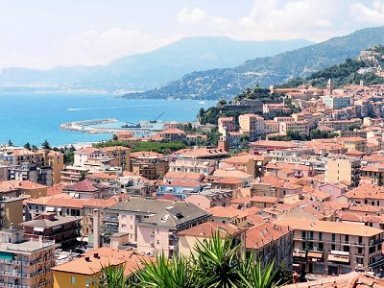 Liguria is better known as the Italian Riviera with, to the north of Genoa the Riviera di Ponente, famous for flowers and olives - and to the east the Riviera di Levante, with dramatic cliffs and pretty fishing villages. Justly famous, its attractions range from throbbing seaside resorts to the lonely isolated coves hidden on one of the most spectacularly beautiful coastlines in Europe. Parts of Tuscany enjoy the same isolation as the Ligurian hinterland. And the beauty of this region is legendary. As the Apennines sweep down towards Firenze, much of the countryside is folded into hills and valleys which hide villages and castles, known only to the few. The Mugello, in the northeast of the region, is one of these places, characterised by thick woodland. 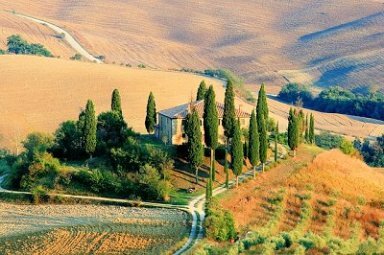 By contrast, the Chianti region, producing Italy's most famous wine, between Firenze and Siena is immensely popular and is a fixture on most travellers' itineraries. Lazio is centred on Italy's capital, Roma (Rome), home to half the region's population. 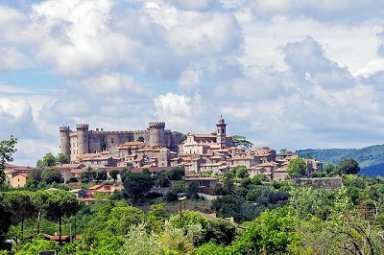 The Landscape surrounding this ancient metropolis ranges from the hills and mountainsof the Apennines to the most important lakes in the southern half of Italy - Bolsena, Bracciano, Vico and Nemi. Each of these was once a volcanic crater and the countryside all around them shows signs of turbulence. 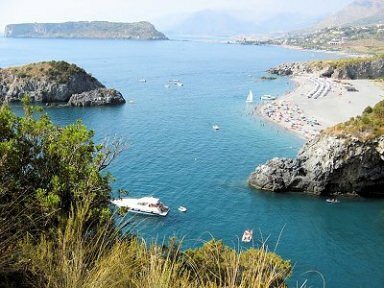 To the west of Rome is a plain which extends southwards along the Tyrrhenian Sea and here are Lazio's sandiest beaches. Abutting Lazio on the east side is the Abruzzo region where the Apennine peaks reach as high as 2.000m(6.500 feet) above sea-level. This is an essentially rustic zone, a large chunk of which is protected by legislation as a National park. Much of Abruzzo is territory unseen by conventional travellers to Italy. Campania, Lazio's neighbour to the south, is often known simply as "the Naples countryside". Centred on this sprawling city, the region presents two distinct faces to the world - an idyllic coastal belt along the Tyrrhenian Sea and, inland, rough mountain terrain. The Romans considered the Bay of Napoli one of their country's most beautiful spots. The far south is perhaps the most intriguing and dramatic part of Italy. Wild, uncontrollable territory alternates with dense woodland and gentle, cultivated plains. For many people, Italy stops at Roma or, at a push, Napoli. Beyond, there is nothing but an unfamiliar, mountainous land mass, full of strange rustics with peculiar customs and leading backwards lives. Nothing could be further from the truth; the attractions of the south are merely less obvious and altogether extraordinary. Most of Calabria and Basilicata is mountainous, with craggy outcrops of rock blanketed with thick forests. Shut away in the hinterland of both regions are remote whitewashed hill villages, cities and castles. Ancient buildings, medieval city centres, and traditional customs, dress and dialect have survived in Calabria and Basilicata as a result of the lie of the land and its inaccessibility. In these areas, and in Puglia too, there are Roman remains as well as Byzantine and Norman architecture and a variety of other evidence of the trail left behind by the conquerors of the south over the centuries. 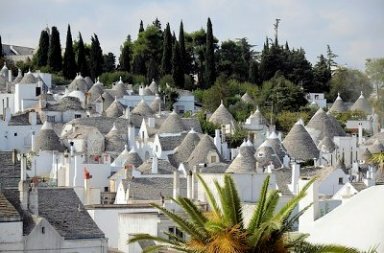 In Puglia, which forms the spur and heel of the boot of Italy, the terrain is mostly gentler - flatter, with grteater areas of cultivation. Some of the region's ports are the busiest in Italy, with regular ferries to Greece and Croatia. It bustles with life, where Calabria and Basilicata seem to brood on their past. 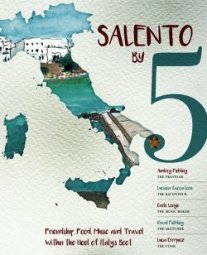 Salento by 5 is a collection of richly woven Italian stories, written by three local Italians and two American travelers. A friendship begins in the Rome airport, migrates to Salento, the southernmost Italian region of Puglia, blossoms over food and wine, and culminates in a narrative filled with nostalgic and personal recollections of Salento’s unique history, culture, and people. Enjoy the book’s watercolor sketches, the local recipes, and off-the-beaten path travel hints that only the Salento by 5 authors can provide. Whether you are an armchair traveler or looking for a new Italian adventure in a not so well known region, Salento by 5 has a little something for everyone. It is already a month after we got back home after a fantastic tour. We would like to thank you for arranging it for us. Everything was perfect and thank you once again for sorting out the car issue. We really appreciate it and would have been in big trouble. We will gladly refer our family and friends to you. I just wanted to send you a note to let you know how much I appreciate all you did in putting together my sons honeymoon trip to London and Paris. Steven and Breanna had an amazing time visiting the two cities and the transportation, hotels and tours you arranged were perfect. I can not tell you enough how much I appreciate all you did to make each of our holidays so enjoyable. I look forward to contacting you when we determine where we will be visiting next.